Welcome to the nineteenth article in our Pride series for the month of June! Each day we will be highlighting a different LGBTQ+ character who we think is a great example of representation, dynamic characterization, and overall badassery. Check out the rest of the series here. Marvel has had a big year both in and outside of the Marvel Cinematic Universe (MCU). In addition to record-breaking box office numbers, Marvel brought us the first canonically LGBTQ+ characters and couples in one of its films. And while there have been LGBTQ+ characters in the Marvel comics, we do not see much of them on movie screens. But there is no questioning this pairing when Negasonic Teenage Warhead (NTW) introduces Yukio to Wade as her girlfriend in Deadpool 2. Marvel’s films have had many characters that fans have speculated about their sexuality through subtext such as Thor: Ragnarok’s Valkyrie (Tessa Thompson) being bisexual, and Deadpool (Ryan Reynolds) himself as pansexual. Thompson and Reynolds have both talked about their character’s sexuality and wanting to portray and explore that, but unfortunately it still did not make it onto our screens. When NTW asks Wade if this is a problem for him, his only response is a quip about anyone actually wanting to date her. 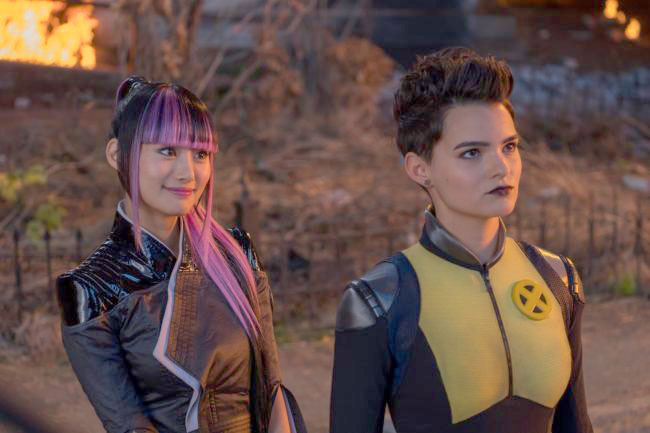 Later in the film, we see NTW and Yukio standing on the balcony of the mansion that is home to the X-Men and Yukio is resting her head on Negasonic’s shoulder. And while that is really all the movie touches on these two characters being a couple, Wade does not treat NTW any differently and he and Yukio seem to genuinely like one another. We have seen LGBTQ+ characters in superhero shows on several network television shows, but movies have a much, much farther reach. And the way that the representation was handled in this film was done quite well. There was no questioning the sexuality of these characters, and it didn’t take away from them as characters or “distract from the story” as many critics of LGBTQ+ representation would argue. Deadpool has pushed many boundaries already being an R-rated film alongside many PG-13 films. Hopefully further Marvel films will follow suit and include more LGBTQ+ representation and superheroes. First Full ‘Rocketman’ Trailer Released! Next story ‘This Is Us’ Season 3 Premiere Date Announced!